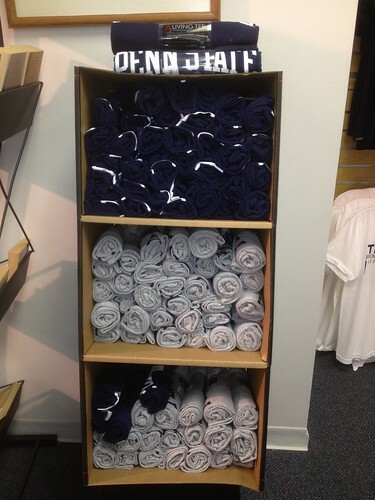 For Sale – rolled Alta Gracia Penn State t-shirts! T-Shirt swap was a huge success! 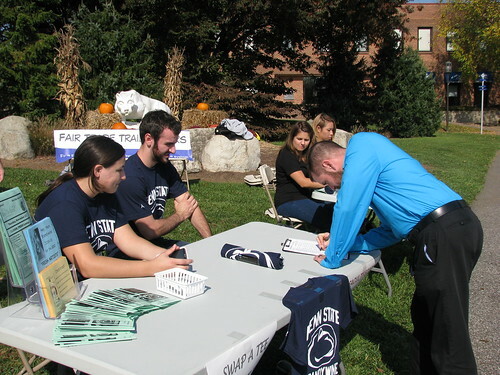 The Penn State Brandywine first Fair Trade T-Shirt Exchange was a huge success. 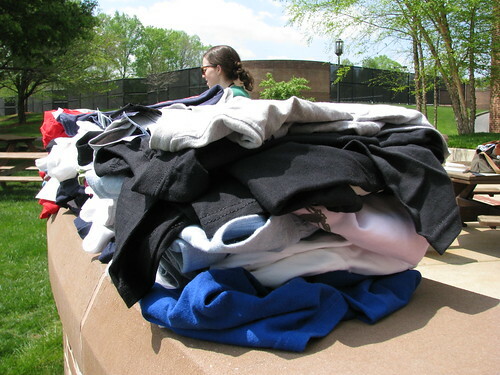 We exchanged 72 t-shirts and received 237 and counting in return! This t-shirt swap could not have been done without all the excellent students in our class, our hard working teacher, and all the staff and faculty around campus. 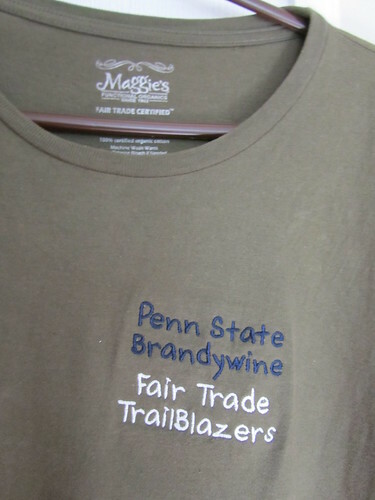 The Penn State Fair Trade t-shirts were purchased from Alta Gracia, which is a fair trade company located in the Dominican Republic, with a grant from the Student Allocations Fee Committee. All the students in the class and our professor Dr. G did a wonderful job preparing for our t-shirt swap. We put together brochures, a list of our URLs for our social networks, and posters to promote Fair Trade and our t-shirt swap. For the swap the rules were simple. 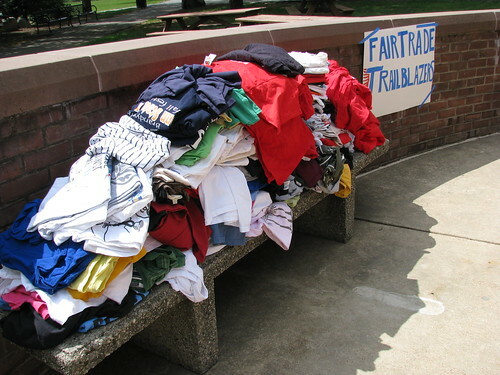 You could bring in any number of t-shirts as long as they were slightly used and wearable, and in exchange the swapper gets one Penn State Fair Trade t-shirt. The swap was held on Wednesday and Thursday of this past week and was held indoors and outdoors. On Wednesday our turnout was fairly small because most of the students and staff were not aware that the swap was going on, despite the flyers and emails. A lot of students were excited about the swap when they saw it and told us that they would be back on Thursday with a t-shirt. On Thursday the swap skyrocketed through the roof in popularity. Students and staff did a great job of contributing. This swap made our movement even more interesting then ever. We had fun with this swap but also did a great job of getting the word out to the students and staff. 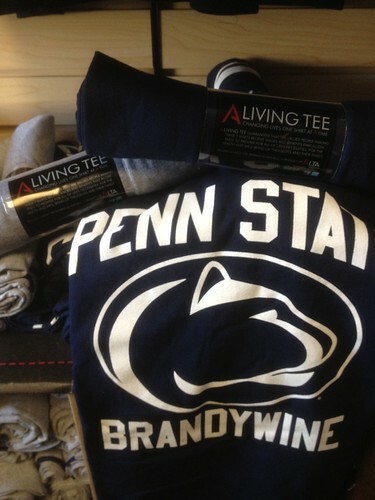 On behalf of our ENVST400W class we would like to thank everyone that made this possible and we would also like to throw a special thank you to Alta Gracia and Joe Buskirk from our Penn State Brandywine bookstore, donating 37 t-shirts from the bookstore himself, for making this swap a huge success. How to host a Fair Trade t-shirt swap! 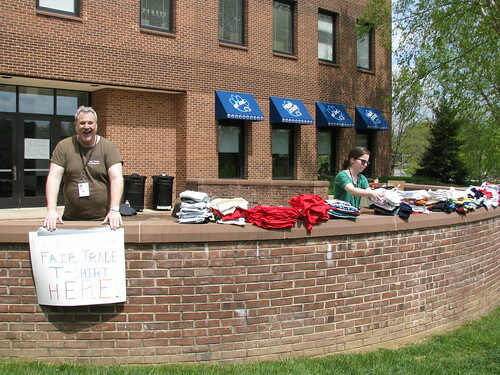 The Fair Trade t-shirt exchange at Penn State Brandywine was a huge success! During our journey toward becoming a Fair Trade University, we have worked toward raising awareness of the Fair Trade movement and our efforts on campus. As part of the process, we’ve committed to hosting several Fair Trade events on campus each semester. Our first big event was hosting Amanda White from Divine Chocolate (read more about it here), and our second event was Wednesday and Thursday’s Fair Trade T-shirt exchange. We hope that our experience can help other campuses learn how to best host a Fair Trade T-shirt Swap! 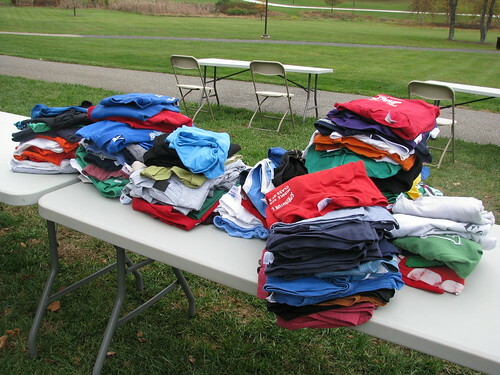 Our t-shirt swap was a two-day event where students could bring in a gently used t-shirt to exchange for a brand new, Fair Trade, Penn State t-shirt from Alta Gracia Apparel. Our 72 Fair Trade tees quickly disappeared, and we received 237 tees for charity in exchange! All of the donated tees were given to local Planet Aid drop boxes. We chose Planet Aid because we felt that their mission of global sustainability and recycling clothing complements the missions of the Fair Trade movement. Get the word out! Be sure to effectively use your campus’s social media and other forms of making announcements to make sure that everyone knows about the event. Everyone wants a free t-shirt (which is a huge draw for spreading the Fair Trade message), but on our campus, not everyone knew about the swap. If we had spread the word a bit better, we could have made a bigger impact. Set your date early, hold the event later. Setting the date early in the semester will help your committee spread the word, so that a t-shirt swap later in the semester will be successful. Apply for funding. You might be surprised at the funds your school will provide for you. We not only got our 72 t-shirts donated (with the help of our campus’s student activity fee), but we also got our student government association to provide funding for us for future activities on campus. Students first! If you are doing a two-day event, dedicate the first day to students only. On the second day, set aside the first half of your event for students and then give staff and faculty the opportunity to swap for a tee. Unfortunately, we ran out so quickly that some students who wanted to participate didn’t get a chance to snag a Fair Trade tee! Have an elevator speech & Fair Trade literature. Some students were confused as to why we were collecting old t-shirts to donate to charity when we had a slew snazzy new shirts to give out for free. “Why don’t you just donate those?” one student asked us. We realized that although we had a brochure that explained why we were doing the swap, and our posters all said something about Fair Trade, the cause of the event was lost on a lot of people. Be prepared with a 30 seconds-or-less “elevator speech” for the students who want to get their hands on free swag. Why are you doing this swap? What is Fair Trade? What are you doing on campus to promote the movement? In addition to the brochure, we handed out a half-sheet of paper that included links to our social media outlets and petition on change.org. 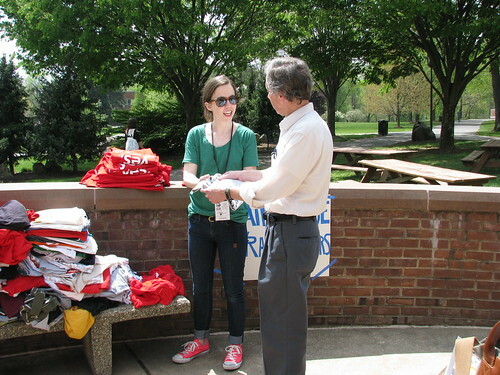 With a campus of about 1600 students, we were able to give away 72 t-shirts without a problem. For campuses with a larger student body, make sure you order enough tees! This is an event that will definitely bring success to your movement on campus.